This was my first time making a rustic tart, or galette. I had an extra pie crust in the freezer from making chicken pot pie, and a big box of blackberries in my fridge, so making this dessert was even easier. What I like about this dessert is that you don’t have to trim off the dough to fit into a pie pan, perfectly fits my no-waste food goal. Preheat oven to 425°F. Line a baking pan with silicon pat or parchment paper, then coat with cooking spray. Combine ground almond, flour and sugar. Roll out pie dough into a 12-13 inch circle between 2 sheets of plastic wrap (it makes transferring dough easy and less mess to clean) to 1/4 inch thick. 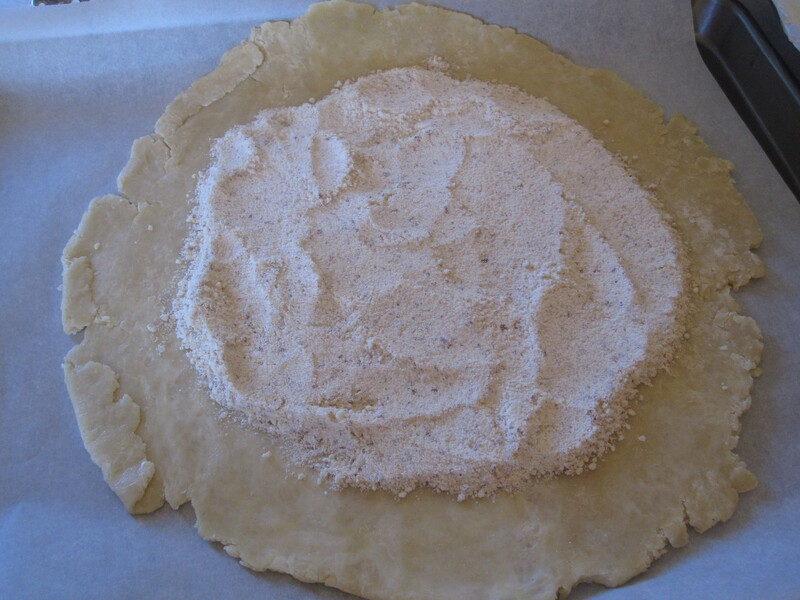 Spread almond mixture evenly in the center of the dough, leaving a 2-inch border along the edge. Toss blackberries, dried cherries, lemon juice and sugar in a bowl. Spoon the fruit over the almond mixture. Fold the edge of the dough over towards the center, making pleats if necessary. Brush the edge with egg wash and sprinkle some more sugar on top of the fruits. Bake at 425°F for 15 minutes, then turn down to 350°F and bake for another 40-45 minutes, until the crust is golden brown. Transfer the tart with silicon pat/parchment paper onto rack to cool. You can use a combination of different fruits for the filling, such as different types of berries, plums, apricot, peach, apples etc. The almond mixture not only keeps the bottom crust from getting soggy (especially when you’re using juicy fruits), but also adds flavor and texture. 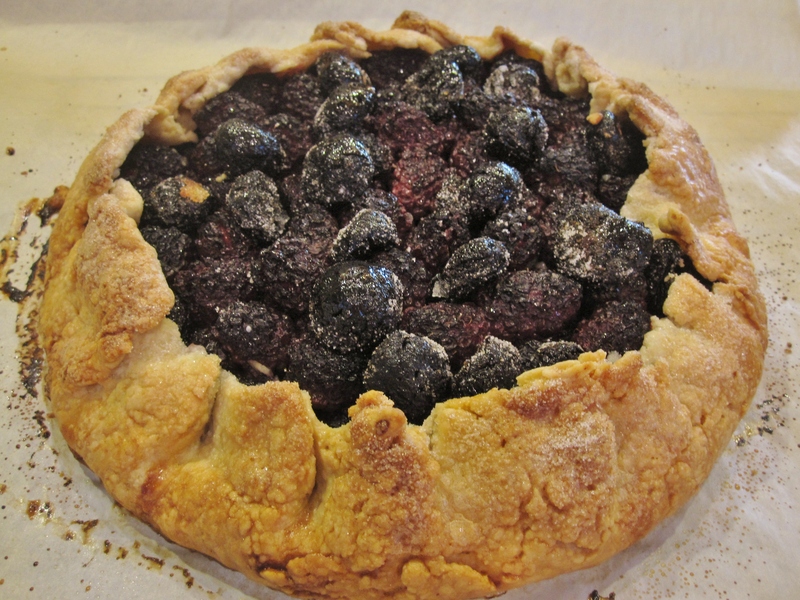 Blackberry Rustic Tart: almond mixture as a base. 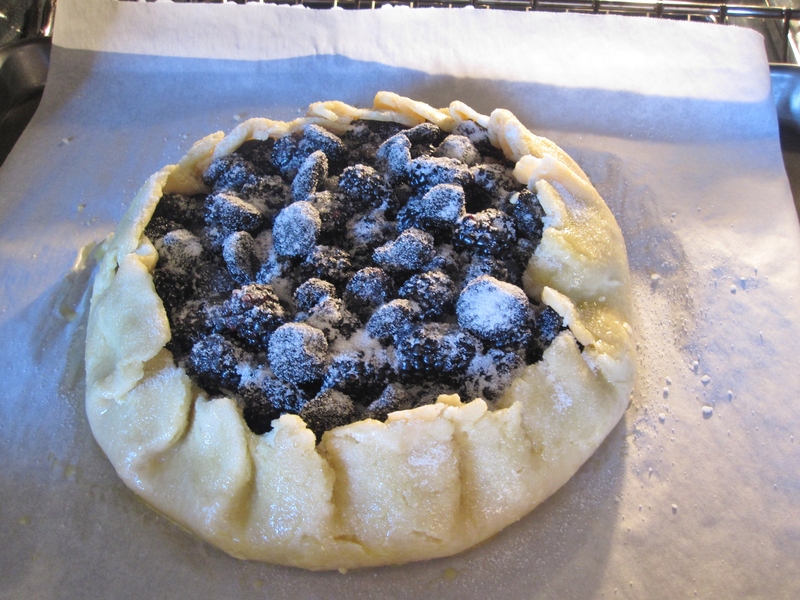 Blackberry Rustic Tart: ready to bake.